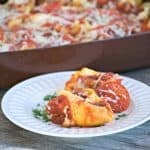 Pepperoni Pizza Stuffed Shells – pasta shells stuffed with ricotta and parmesan cheese, diced pepperoni and topped with pizza sauce. 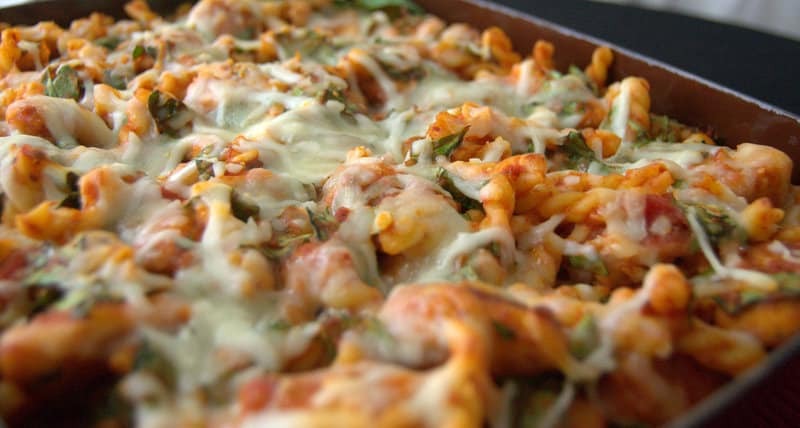 This easy dinner will be a great twist on Pizza night. We have a pizza at least once a week at our house. There’s this little place that opened last year in our area which sells NY pizza and it’s outrageously delicious. For as long as I can remember, this family’s been on the hunt for great pizza. Wherever we’re living or wherever we’re traveling, we always make it a point to read the reviews and search a place out even if it requires a bit of driving to get there. If it’s great pizza, I could probably eat it any day of the week. When I was young, my parents took me to St. Louis to see a college hockey tournament. We ordered pizza one night in our hotel room and I remember my mother being so disgusted because it was covered with Velveeta cheese. I don’t know maybe it’s a St. Louis type pizza, but I just remember mom being irate that dinner was “ruined”. I don’t even remember how it tasted. Now every time we’re in St. Louis, I always think back to that and being in the Checkerdome. 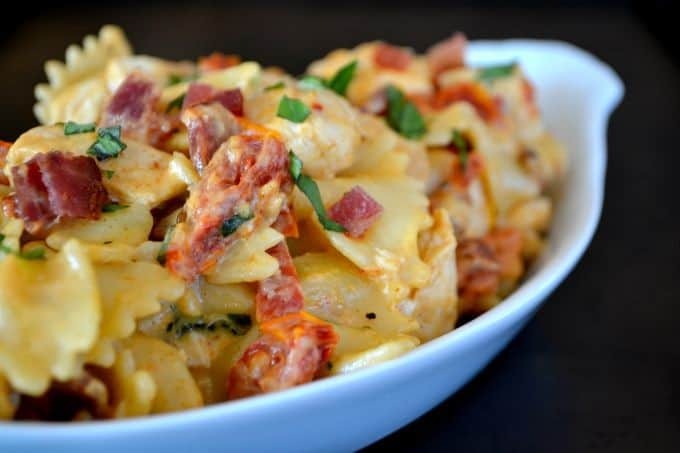 Pasta is also a big thing at our house and when I say big, I mean B-I-G! We usually have that once a week as well and on any given day, you can find our son at the stove boiling water making some for a snack or his own for lunch. He eats it that much. So, with this recipe, I figured why not combine the two? 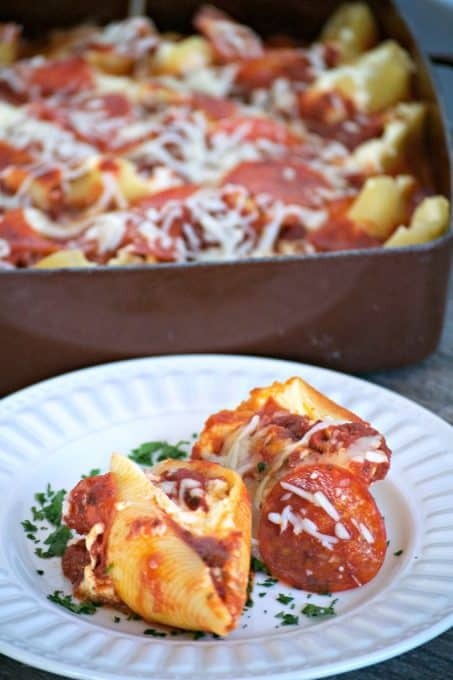 It makes for an easy dinner that the whole family enjoys and really satisfied the pepperoni craving I was having. I’ve recently started sending out a weekly newsletter, so you can sign up for that here as well! If you’ve been on Facebook in the past few months, you’ve probably seen some people doing LIVE segments. These are really great segments because they’re fun, interactive and you’re able to see a person or people behind a brand, group or page. I’ve started doing them as well here on the 365 Days of Baking Facebook Page. I’d love for you to join me every Monday and Friday when I make a live recipe. Every Tuesday, is our Tuesday’s Two Cents when I share a kitchen tip and then I answer questions and we just chill. I don’t have a set time that I do them because inevitably something comes up, so I just hop on when I’m ready on those three days. It’s a lot of fun and has been a great way to connect with my followers. I’m SO very grateful that my page has grown so much over the past few years, but at the same time I miss the way it used to be when it was small. This way you have the opportunity to see me in all my glory right here in my very own kitchen. I’d love to share that with you and I hope you’ll join us! 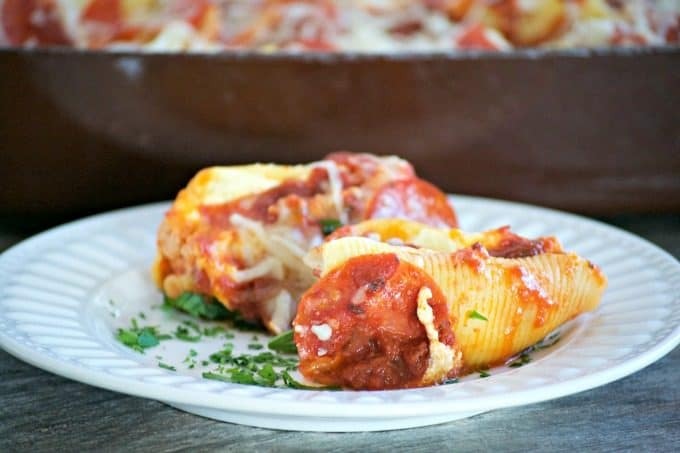 Pepperoni Pizza Stuffed Shells - pasta shells stuffed with ricotta and parmesan cheese, diced pepperoni and topped with pizza sauce. A great idea for Pizza night! Preheat oven to 400 degrees F. Prepare a 9 X 13-inch baking dish by spraying it with cooking spray. 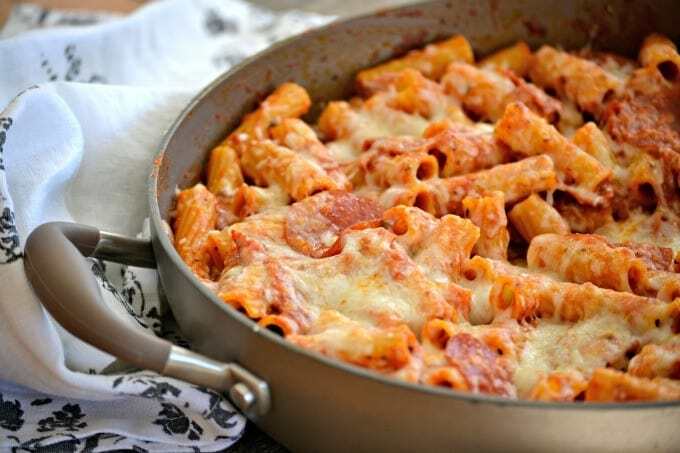 Pour one jar of the pizza sauce into the pan and spread evenly. In a medium bowl combine the egg, ricotta and Parmesan cheeses, 1 cup of the mozzarella, and the parsley. Mix until well combined. Set 30 whole pepperoni aside and cut the remainder up into quarters. Place the quartered pepperoni into the bowl and mix well with the other ingredients. Spoon stuffing into cooked shells, about two tablespoons in each. 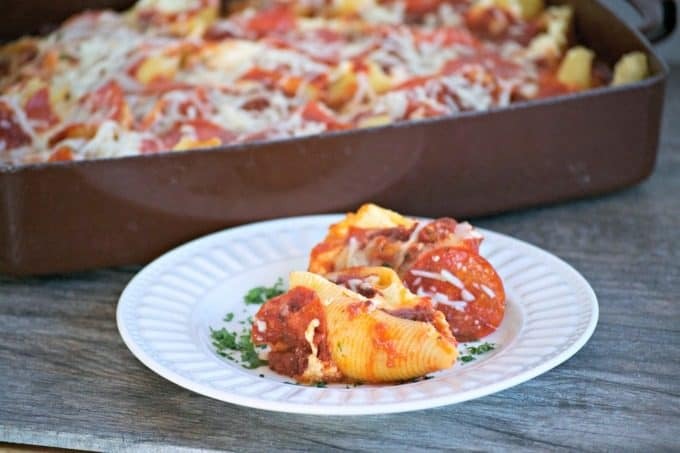 Place shells into prepared baking dish and cover with the second jar of pizza sauce. 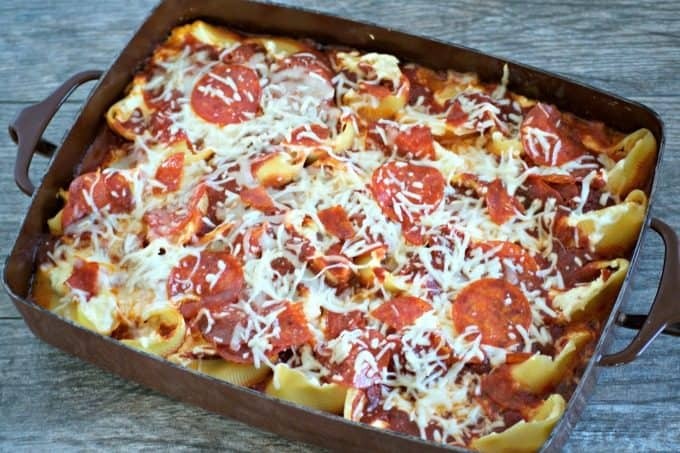 Evenly distribute the whole pepperoni over the shells. Remove foil and sprinkle with remaining mozzarella cheese. Bake for another 5 - 7 minutes or until cheese has melted.